Did you know that dental veneers have been around for about a century? And in that long span of time, dental veneers have evolved drastically. Dental veneers of today are so far from those removable tooth caps that started it all. If you think you will need veneers, it is a good idea to know more about how they have changed over the years! Porcelain veneers have first been used in the late 1920s. Its use began in Hollywood when a dentist from California named Charles Pincus thought of a way to improve the smiles of his celebrity patients. Dr. Pincus came up with the idea of making an acrylic tooth cap and fitting it over a patient’s existing tooth. Hollywood stars would wear those caps during the filming of movie scenes and then remove them afterward. This may seem too different from the porcelain permanent veneers that we have today, but it really is the beginning of dental veneers and how they were used to perfect people’s smiles. Regular people then began getting that particular type of dental veneers to improve their smile up until the early 1950s. This dental solution was especially popular among those who have damaged or lost teeth. In the 1950s, dentists were already bonding veneers to the surface of teeth. The problem, however, was that the veneers, which were then already made of either composite or porcelain, would not adhere properly to the teeth’s surface. It was Dr. Michael Bunocore who discovered that using a mild acid to lightly etch the surface of the tooth made bonding easier and stronger. It was during this time that veneers became a more permanent and attractive option. It was in the early 1980s that veneers that are similar to what we have today began. Dental veneers also became more affordable, making them popular among people who wish to get improvements for cosmetic reasons. Today’s veneers look very real that it is very hard to tell if someone is wearing them. Now you can choose between two options: traditional and no-preparation veneers. For traditional veneers, a small amount of enamel from your teeth will be removed to make room for the veneers. For no-preparation veneers, there is no need to modify your natural teeth as the veneers are directly fitted over your natural teeth. While the very first veneers were temporary and for short-term use, the ones we have available today are permanent. High-quality veneers can last anywhere between 2 to 20 years. Veneers have really come a long way and now it has reached that stage where they look just like your natural teeth. Colour- matching with your existing teeth is, of course, an important aspect and that’s where the dentist’s and the dental laboratory’s skills come into play. Being able to create a natural-looking veneer with subtle translucency and the right shape for our patients is what sets Pickering Square Dental apart from others. Veneers can fix a lot of problems like chipped, decayed, broken, or gapped tooth. But don’t just get veneers anywhere! 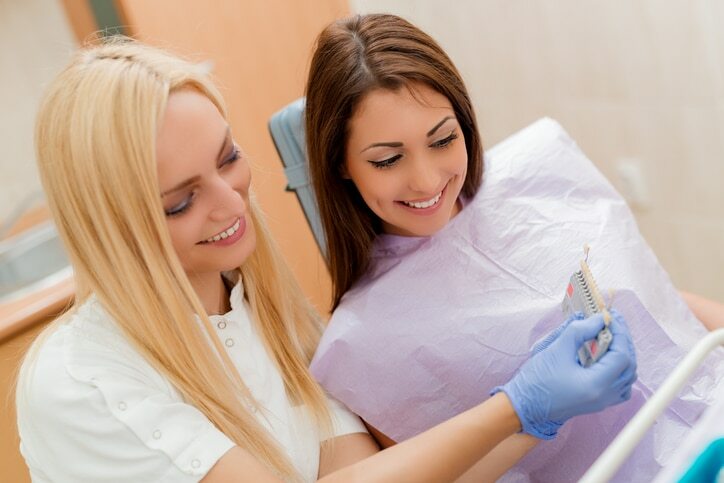 Choose Pickering Square Dental to make sure that you get the best veneers! Our attention to detail and meticulous veneer application ensure that you will get that gorgeous smile that you are looking for.